The Sounders allowed the second-fewest goals in MLS this season, their defending so formidable they were 18-2-3 when scoring at least once in games. Small wonder goalkeeper Stefan Frei, center back Chad Marshall and defensive midfielder Osvaldo Alonso are finalists for three of the league's top individual awards. 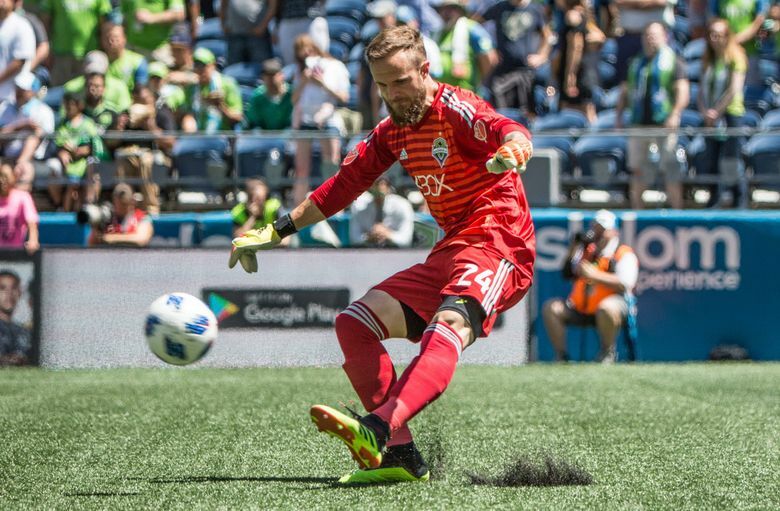 Stefan Frei feels it shouldn’t surprise that three Sounders nominated for individual Major League Soccer awards all specialize in keeping the ball out of the net. Say what you will about the team’s offensive stars, but defending is the backbone of a squad that is 47-24-22 under coach Brian Schmetzer in regular season and playoffs with two finals appearances and one title since mid-2016. So, Frei being named a top-three finalist Wednesday for MLS Goalkeeper of the Year, Chad Marshall for Defender of the Year and defensive midfielder Osvaldo Alonso for Comeback Player of the Year makes plenty of sense even if their efforts do get overlooked at times. “That’s the thing with goalkeepers and defenders mainly,’’ Frei said. “If you don’t watch 90-minute games and then you end up just watching highlights, you don’t really see them that much unless they’re having an absolute blunder and as a goalkeeper you don’t want to be doing that. The finalists were chosen in voting by MLS players, coaching and front office staff and media members. Winners will be announced later this month. The Sounders have consistently kept opponents from scoring since making a midseason run to the playoffs in 2016, registering four postseason shutouts en route to an MLS Cup title. Last year, they ran a record six-game shutout streak through the end of the regular season and entire playoffs before finally being scored on in the second half of a loss in the championship match. Then came this season, when the Sounders struggled to score throughout the first half but still maintained one of the league’s stingiest goals allowed records. When forward Raul Ruidiaz was added in July and midfielders Nicolas Lodeiro and Victor Rodriguez recovered from injury, a suddenly productive attack combined with the already-potent defending made the Sounders practically unbeatable. The Sounders are an incredible 18-2-3 this season in games where they score at least once. Their 37 goals allowed was second best in all MLS and helped offset an offense tied for 13th in goals scored among 23 teams. Frei said his own decision making has improved when playing the ball forward and he’s cut down on blatant mistakes — citing a late Sept. 29 stoppage time miscue in a loss to Philadelphia as his only one the past two years. Frei made 33 starts and set a franchise record with 114 saves this season. His 1.03 goals-against average was second highest in the league for keepers with at least 15 games played. He also has a 290-minute shutout streak in July and his nine consecutive wins in the second half were a league record in the post shootout era. But Frei, widely considered the favorite in his award category against Columbus netminder Zack Steffen and Luis Robles of the New York Red Bulls, said he’s tougher on himself now than when he struggled earlier in his career. Alonso, like Frei, has never won a major MLS award and is up against L.A. Galaxy star Zlatan Ibrahimovic and veteran Gyasi Zardes of Columbus. After gutting through injuries during the 2016 MLS Cup run, Alonso was slowed through most of 2017 by leftover and newly accumulated hurts. This year, Alonso missed most of the first three months still battling injuries, but became a lineup mainstay by June. The Sounders went 14-5-2 in the 21 games started by Alonso, who formed a potent midfield combo alongside Gustav Svensson. Veteran center back Marshall was Defender of the Year three previous times in 2008, 2009 and 2014 — the only MLS player to win it more than twice — and is up against Michael Parkhurst of the Atlanta United and Aaron Long of the New York Red Bulls. Besides anchoring the second-stingiest back line in the league, Marshall matched a career high by scoring four goals. Frei arrived in Seattle alongside Marshall in 2014 and has had an up-close view of the defender ever since. He said Marshall’s consistency trumps his stats. Just as the Sounders are also looking like a completed package now that the defenders carrying them much of the past three seasons finally have some consistent scoring to balance things out.